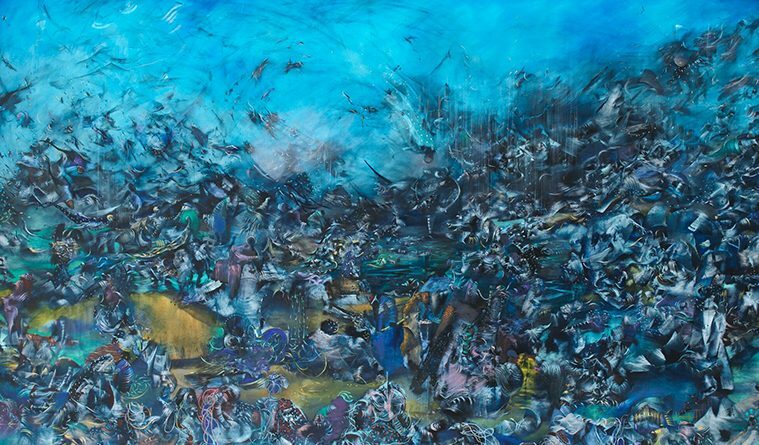 Ali Banisadr, We Haven’t Landed on Earth Yet, 2012, oil on linen. © Ali Banisadr. Photo: Jeffrey Sturges. 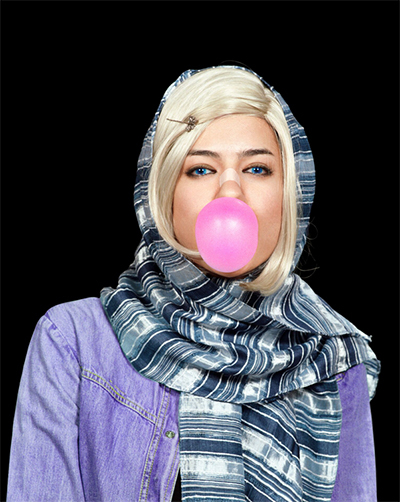 Shirin Aliabadi, Miss Hybrid 3, 2008, chromogenic print. © Shirin Aliabadi. Courtesy: Mohammed Afkhami Foundation. One shouldn’t read too much into serendipitous timing, but I can’t help noting that Rebel, Jester, Mystic, Poet: Contemporary Persians —The Mohammed Afkhami Collection, on view through Sept. 24 at the Museum of Fine Arts, Houston, is the fourth exhibition of post-revolutionary art the MFAH has mounted in 2017. It opened a week after the arrival of Paint the Revolution: Mexican Modernism, 1910–1950 (on view through Oct. 1), which filled galleries vacated by Adiós Utopia: Dreams and Deceptions in Cuban Art Since 1950, which was joined by the small companion show Cuban Photography after 1980: Selections from the Museum’s Collection. Maybe the revolution won’t be televised, but these days it can at least hope for a catalogue and tour. Given the Supreme Court’s recent, partial reinstatement of the Trump Administration’s order banning travel from Iran and six other predominantly Muslim countries, the Contemporary Persians exhibition seems almost eerily timely. Indeed, two participating U.S.-based artists dared not attend the traveling show’s February debut at Toronto’s Aga Khan Museum due to uncertainty over the ban. Afkhami, a dashing British-Iranian, Dubai-based investment banker, told Abu Dhabi’s The National that his grandfather’s art collection had been dispersed by Iran’s government following the revolution. Now it was the U.S. complicating what he called “a culmination of a family dream” as well as curator Fereshteh Daftari’s stated interest in presenting Western audiences with a previously unfamiliar side of Iran. However unfamiliar Iran itself is to most Westerners, much of the art seen here will ring a bell for viewers who have seen other countries’ artists adapt to their own ends the means of international abstraction, Pop Art, and the kind of conceptualism that relies on loaded found-or-altered materials for much of its impact. For instance, Adiós Utopia visitors who saw Tonel’s 1989 installation The blockade, which featured a set of cinder blocks in the shape of Cuba, will find familiar artistic terrain in Farhad Moshiri’s Flying Carpet, which is comprised of a stack of 32 carpets—or really two stacks, since Moshiri carved the shape of a fighter aircraft out of the original stack. 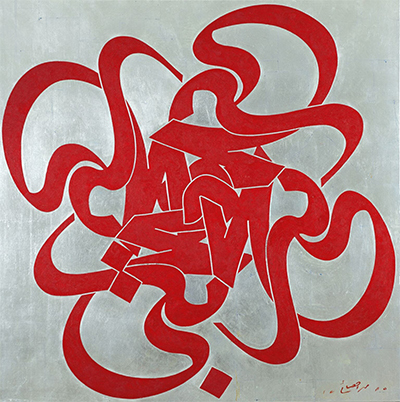 Mohammad Ehsai, Mohabbat (Kindness), 2006, oil and silver leaf on canvas. © Mohammad Ehsai. Courtesy: Mohammad Afkhami Foundation. I’d love to have seen lots more work from both Banisadr and Haerizadeh and from abstract painters Y.Z. Kami and Shirazeh Houshiary, who use the obsessive repetition of Islamic- and Arabic-inspired forms to hypnotic or meditative effect (a virtue found in a number of works). Unfortunately, Daftari has opted for one artwork each for most of the twenty-three artists represented. (One is Houshiary, who has an equally effective sculpture titled Pupa, a twisting vortex of translucent purple glass bricks.) Perhaps this emphasis on breadth over depth reflects Akfhami’s approach to collecting—one shared by Audrey Jones Beck in her approach to Impressionist and Post-Impressionist art—but with just over two dozen works on view, we simply don’t have enough to go on. What is clear, nonetheless, is that contemporary Iranian artists are availing themselves of a long, rich national heritage and the idioms and materials of recent international art movements.